We've all seen it. It happens in every implementation once: Somebody with site collection owner rights drills too far down when editing a list and unknowingly renames the Title site column. There are a number of ways of fixing the issue. Use SP Manager. 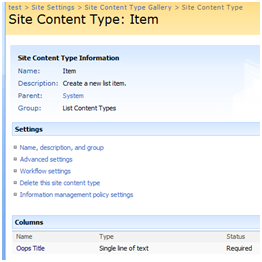 http://spm.codeplex.com/ with this tool, you can open up your SharePoint farm, drill down to your site collection fields and reset the field back to Title. You need to run this application directly on one of your SharePoint servers, but if you have that kind of access, this is probably the easiest fix. Use the object model (SP Manager uses the object model as well). You can probably write a powershell script or a console application that will fix up your title field without too much trouble. A little bing searching will probably get you one ready made. Again, you need to do this from one of your SharePoint servers, and if you can get SP Manager on your server, it's probably the easier route. Use the webs.asmx web service. Using this option will allow you to fix the field from off the box. You'll need to write a console application with a web reference to do this. 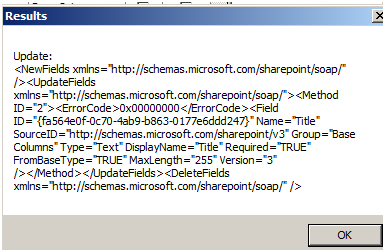 Get the SP Schema Migrator. I downloaded and recompiled the code, but you can probably just use the precompiled executable. Make the altered title column visible. 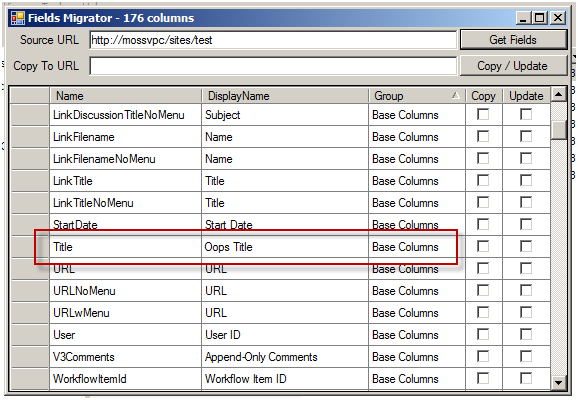 Use SP Schema Migrator to pull the fields from your site to be corrected. 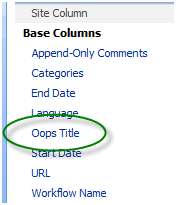 Using the same site as your destination site, click the copy/update button to repair your title field. Now go back in the browser and change your title field's group back to _Hidden. The most painful step – Any lists that had a renamed title field will need to be changed again. For example, the contacts list has the title field renamed to "Last Name". These will now all say "Title" in place of last name. You'll need to go through each of these individually and manually change the column back to "Last Name". You need to make your title field visible. So go to your content type library and edit your item content type. 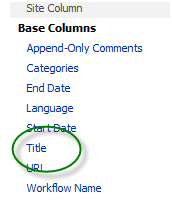 Click your altered title field and then click the edit site column in new window link. Change your field's group from _Hidden to some other group. I used Base Columns here. Then click OK to save your changes. 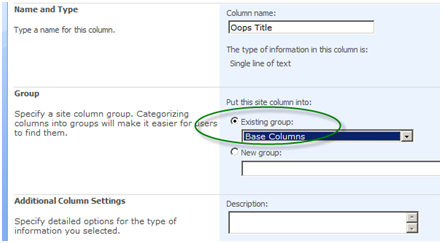 You should now see your altered column in the site column gallery. Enter your broken site in the source URL and click get fields. You should see your problem column come back. 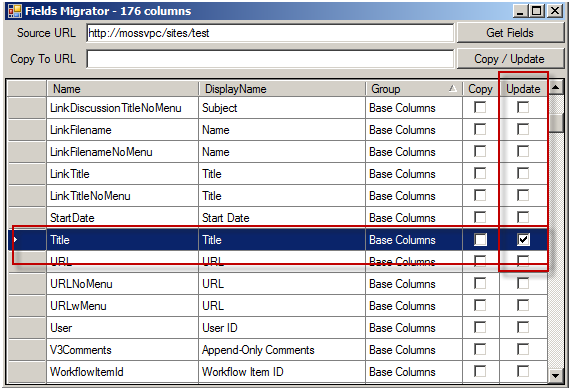 Correct the DisplayName for the Title field and check the Update box. Make sure you click off the row after you've made your changes, this will update the dataset so the tool knows you've made changes manually. Using the source URL for the copy to URL, click the copy/update button. A message box will open with the results from the web service. Hit OK and close the fields migrator. 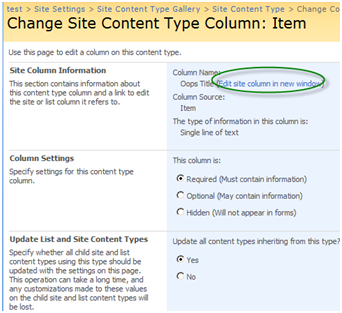 Back in the site column gallery, you should see your title field has been corrected. Click your Title Field and go to its edit page. Change its group to _Hidden and hit OK.
Now you'll need to go clean up any lists where you actually do want the title field named something else. For example, you probably want to go change 'Title' to 'Last Name' in any contact lists.